This article is about the general social theory. For business influence in politics, see Corporatocracy. For the process of reorganizing institutions on a corporate or business basis, see Corporatization. For Corporatism in animals, see Sociality § Corporatism. Corporatism is a political ideology which advocates the organization of society by corporate groups, such as agricultural, labour, military, scientific, or guild associations on the basis of their common interests. The idea is that when each group performs its designated function, society will function harmoniously — like a human body (corpus) from which its name derives. Corporatist ideas have been expressed since Ancient Greek and Roman societies, with integration into Catholic social teaching and Christian democracy political parties. They have been paired by various advocates and implemented in various societies with a wide variety of political systems, including authoritarianism, absolutism, fascism, liberalism and socialism. ✪ What is Crony Capitalism? Crony capitalism. What is it? Why is it so bad? To answer these questions, let’s think about good, old-fashioned capitalism. It is premised on the free exchange of goods or services between independent agents. Let’s say I want to buy some cereal. Steve’s Grocery is selling my brand for $4. Ted’s Grocery has it for $5. I buy from Steve, which creates the most value for both me and him. Meanwhile, Ted now has an incentive to cut his costs so he can compete better. Replicate this kind of transaction billions of times a day, 365 days a year, and that is how our economy functions and grows. Or at least how it’s supposed to. Now, what about crony capitalism? Let’s say it’s the government that wants to buy some cereal. More specifically, the House of Representatives’ Committee for Cereal Acquisition is put in charge of the task. Steve still sells it for $4. Ted for $5. I buy from Steve. He’s the low price man. But the Committee for Cereal Acquisition buys from Ted. Why? Because Ted lobbied the committee. Because his corporate headquarters is in the chairman’s district. Because he gave more campaign contributions. Because he promised a lobbying gig to an undecided committee member who plans to retire next year. That is how crony capitalism works. And it happens all throughout the government—from defense contracting, to farm subsidies, clean energy programs, infrastructure spending, affordable housing, food stamps, Medicare, Obamacare, tax policy. You pretty much name it. Crony capitalism is there. Capitalism is moral because it is premised on a voluntary exchange between independent parties--who agree to the deal only because it creates value for everybody. Crony capitalism is immoral because one of the parties—the government—has been bought off. This creates three problems. First, it is unfair. Politicians are spending the public’s money, but not for the public interest. Instead, they reward friends, supporters, or themselves. Our Constitution grants Congress the power to provide for the general welfare. Crony capitalism violates this sacred principle. Second, it is incredibly wasteful. In our cereal example, the government overpaid by going with Ted instead of Steve. That’s obviously a waste of taxpayer money. In fact, it is really stealing from the taxpayer. Here’s more waste. Ted had to spend money to lobby the government to get the contract. So, he didn’t get all of that dollar out of the transaction. That’s money that could have been spent making a better product or used in some other constructive way. Economists call this deadweight loss. And it can be substantial. Moreover, crony capitalism distorts the broader economy. In some industries—like healthcare, student loans, home mortgages, and aerospace—the government is one of the biggest purchasers of goods or services. So its politicized decisions can have wide-ranging and detrimental effects. An entire industry can become, in effect, a client of the government. When that happens its goal is not to build a better mousetrap, but to keep politicians happy. How much does crony capitalism cost society per year? It is hard to say precisely, but the number reaches into the tens of billions of dollars, maybe beyond. Third, it tempts politicians to break the law. Once politicians feel free to spend the public’s money for their own political purposes, they are just a hop-skip-and-a-jump away from doing so to line their own pockets or pump up their campaign funds or both. So what can we do? Our first task is to recognize that government must have limits. Of course, there has to be a national authority to set the parameters for society; that establishes the rules of the game and enforces them. But when we expect the government to promote an industry, tinker with some sector of the economy, help some important voter group, we create the groundwork for crony capitalism and all the bad things that come with it–favoritism, waste, theft, and other forms of corruption. America’s seventh President, Andrew Jackson, had a very useful perspective on this issue. “There are no necessary evils in government,” he said. “Its evils exist only in its abuses. If it would confine itself to equal protection, and, as Heaven does its rains, shower its favors alike on the high and the low, the rich and the poor, it would be an unqualified blessing.” Jackson had it right. A limited government confined to equal protection can’t play favorites. Limited government. If getting rid of crony capitalism is the goal, it all starts there. I’m Jay Cost of the Weekly Standard for Prager University. Kinship-based corporatism emphasizing clan, ethnic and family identification has been a common phenomenon in Africa, Asia and Latin America. Confucian societies based upon families and clans in East Asia and Southeast Asia have been considered types of corporatism. China has strong elements of clan corporatism in its society involving legal norms concerning family relations. Islamic societies often feature strong clans which form the basis for a community-based corporatist society. Family businesses are common worldwide in capitalist societies. In the Middle Ages, the Catholic Church sponsored the creation of various institutions including brotherhoods, monasteries, religious orders and military associations, especially during the Crusades, to sponsor association between these groups. In Italy, various function-based groups and institutions were created, including universities, guilds for artisans and craftspeople and other professional associations. The creation of the guild system is a particularly important aspect of the history of corporatism because it involved the allocation of power to regulate trade and prices to guilds, which is an important aspect of corporatist economic models of economic management and class collaboration. In 1881, Pope Leo XIII commissioned theologians and social thinkers to study corporatism and provide a definition for it. In 1884 in Freiburg, the commission declared that corporatism was a "system of social organization that has at its base the grouping of men according to the community of their natural interests and social functions, and as true and proper organs of the state they direct and coordinate labor and capital in matters of common interest". Corporatism is related to the sociological concept of structural functionalism. Corporatism's popularity increased in the late 19th century and a corporatist internationale was formed in 1890, followed by the publishing of Rerum novarum by the Catholic Church that for the first time declared the Church's blessing to trade unions and recommended for organized labour to be recognized by politicians. Many corporatist unions in Europe were endorsed by the Catholic Church to challenge the anarchist, Marxist and other radical unions, with the corporatist unions being fairly conservative in comparison to their radical rivals. Some Catholic corporatist states include Austria under the leadership of Federal Chancellor Engelbert Dollfuss and Ecuador under the leadership of Garcia Moreno. The economic vision outlined in Rerum novarum and Quadragesimo anno also influenced the regime of Juan Perón and Justicialism. In response to the Roman Catholic corporatism of the 1890s, Protestant corporatism was developed, especially in Germany, the Netherlands and Scandinavia. However, Protestant corporatism has been much less successful in obtaining assistance from governments than its Roman Catholic counterpart. Ancient Greece developed early concepts of corporatism. Plato developed the concept of a totalitarian and communitarian corporatist system of natural-based classes and natural social hierarchies that would be organized based on function, such that groups would cooperate to achieve social harmony by emphasizing collective interests while rejecting individual interests. In Politics, Aristotle also described society as being divided along natural classes and functional purposes that were priests, rulers, slaves and warriors. Ancient Rome adopted Greek concepts of corporatism into their own version of corporatism but also added the concept of political representation on the basis of function that divided representatives into military, professional and religious groups and created institutions for each group known as colegios (Latin: collegia). See collegium (ancient Rome). Absolute monarchies during the late Middle Ages gradually subordinated corporatist systems and corporate groups to the authority of centralized and absolutist governments, resulting in corporatism being used to enforce social hierarchy. After the French Revolution, the existing absolutist corporatist system was abolished due to its endorsement of social hierarchy and special "corporate privilege" for the Roman Catholic Church. The new French government considered corporatism's emphasis on group rights as inconsistent with the government's promotion of individual rights. Subsequently corporatist systems and corporate privilege throughout Europe were abolished in response to the French Revolution. From 1789 to the 1850s, most supporters of corporatism were reactionaries. A number of reactionary corporatists favoured corporatism in order to end liberal capitalism and restore the feudal system. From the 1850s onward, progressive corporatism developed in response to classical liberalism and Marxism. These corporatists supported providing group rights to members of the middle classes and working classes in order to secure cooperation among the classes. This was in opposition to the Marxist conception of class conflict. By the 1870s and 1880s, corporatism experienced a revival in Europe with the creation of workers' unions that were committed to negotiations with employers. In his work Gemeinschaft und Gesellschaft ("Community and Society") of 1887, Ferdinand Tönnies began a major revival of corporatist philosophy associated with the development of neo-medievalism and increased promotion of guild socialism and causing major changes of theoretical sociology. Tönnies claims that organic communities based upon clans, communes, families and professional groups are disrupted by the mechanical society of economic classes imposed by capitalism. The National Socialists used Tönnies' theory to promote their notion of Volksgemeinschaft ("people's community"). However, Tönnies opposed Nazism and joined the Social Democratic Party of Germany in 1932 to oppose fascism in Germany and was deprived of his honorary professorship by Adolf Hitler in 1933. 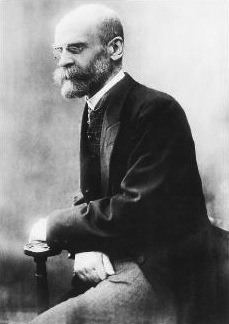 Sociologist Émile Durkheim advocated a form of corporatism termed "solidarism" that advocated creating an organic social solidarity of society through functional representation. Solidarism was based upon Durkheim's view that the dynamic of human society as a collective is distinct from that of an individual, in that society is what places upon individuals their cultural and social attributes. Durkheim posited that in the economy solidarism would alter the division of labour by changing it from the mechanical solidarity to organic solidarity. He believed that the existing industrial capitalist division of labour caused "juridical and moral anomie", which had no norms or agreed procedures to resolve conflicts, resulting in chronic confrontation between employers and trade unions. Durkheim believed that this anomie caused social dislocation and felt that by this "[i]t is the law of the strongest which rules, and there is inevitably a chronic state of war, latent or acute". As a result, Durkheim believed it is a moral obligation of the members of society to end this situation by creating a moral organic solidarity based upon professions as organized into a single public institution. The idea of liberal corporatism has also been attributed to English liberal philosopher John Stuart Mill who discussed corporatist-like economic associations as needing to "predominate" in society to create equality for labourers and give them influence with management by economic democracy. Unlike some other types of corporatism, liberal corporatism does not reject capitalism or individualism, but believes that the capitalist companies are social institutions that should require their managers to do more than maximize net income by recognizing the needs of their employees. This liberal corporatist ethic is similar to Taylorism, but endorses democratization of capitalist companies. Liberal corporatists believe that inclusion of all members in the election of management in effect reconciles "ethics and efficiency, freedom and order, liberty and rationality". Liberal corporatism began to gain disciples in the United States during the late 19th century. Liberal corporatism was an influential component of the progressivism in the United States that has been referred to as "interest group liberalism". In the United States, economic corporatism involving capital-labour cooperation was influential in the New Deal economic program of the United States in the 1930s as well as in Keynesianism and even Fordism. Fascism's theory of economic corporatism involved management of sectors of the economy by government or privately-controlled organizations (corporations). [citation needed] Each trade union or employer corporation would theoretically represent its professional concerns, especially by negotiation of labour contracts and the like. It was theorized that this method could result in harmony amongst social classes. However, authors have noted that historically de facto economic corporatism was also used to reduce opposition and reward political loyalty. In Italy from 1922 until 1943, corporatism became influential amongst Italian nationalists led by Benito Mussolini. The Charter of Carnaro gained much popularity as the prototype of a "corporative state", having displayed much within its tenets as a guild system combining the concepts of autonomy and authority in a special synthesis. Alfredo Rocco spoke of a corporative state and declared corporatist ideology in detail. Rocco would later become a member of the Italian fascist regime. [The state] is not simply a mechanism which limits the sphere of the supposed liberties of the individual... Neither has the Fascist conception of authority anything in common with that of a police ridden State... Far from crushing the individual, the Fascist State multiplies his energies, just as in a regiment a soldier is not diminished but multiplied by the number of his fellow soldiers. A popular slogan of the Italian Fascists under Mussolini was "Tutto nello Stato, niente al di fuori dello Stato, nulla contro lo Stato" ("everything for the state, nothing outside the state, nothing against the state"). This prospect of Italian fascist corporatism claimed to be the direct heir of Georges Sorel's revolutionary syndicalism, such that each interest was to form as its own entity with separate organizing parameters according to their own standards, but only within the corporative model of Italian fascism each was supposed to be incorporated through the auspices and organizing ability of a statist construct. This was by their reasoning the only possible way to achieve such a function, i.e. when resolved in the capability of an indissoluble state. Much of the corporatist influence upon Italian Fascism was partly due to the Fascists' attempts to gain endorsement by the Roman Catholic Church that itself sponsored corporatism. However, fascism's corporatism was a top-down model of state control over the economy while the Roman Catholic Church's corporatism favoured a bottom-up corporatism, whereby groups such as families and professional groups would voluntarily work together. The fascist state corporatism (of Roman Catholic Italy) influenced the governments and economies of a not only other Roman Catholic-majority countries, such as the governments of Engelbert Dollfuss in Austria and António de Oliveira Salazar in Portugal, but also Konstantin Päts and Kārlis Ulmanis in non-Catholic Estonia and Latvia. Fascists in non-Catholic countries also supported Italian Fascist corporatism, including Oswald Mosley of the British Union of Fascists, who commended corporatism and said that "it means a nation organized as the human body, with each organ performing its individual function but working in harmony with the whole". Mosley also considered corporatism as an attack on laissez-faire economics and "international finance". The corporatist state Salazar established in Portugal was not associated with Mussolini, Portugal during Salazar's reign was considered Catholic corporatism. Portugal remained neutral throughout World War II. Salazar also had a strong dislike of Marxism and liberalism. In 1933, Salazar stated: "Our Dictatorship clearly resembles a fascist dictatorship in the reinforcement of authority, in the war declared against certain principles of democracy, in its accentuated nationalist character, in its preoccupation of social order. However, it differs from it in its process of renovation. The fascist dictatorship tends towards a pagan Caesarism, towards a state that knows no limits of a legal or moral order, which marches towards its goal without meeting complications or obstacles. The Portuguese New State, on the contrary, cannot avoid, not think of avoiding, certain limits of a moral order which it may consider indispensable to maintain in its favour of its reforming action". During the post-World War II reconstruction period in Europe, corporatism was favoured by Christian democrats (often under the influence of Catholic social teaching), national conservatives and social democrats in opposition to liberal capitalism. This type of corporatism became unfashionable but revived again in the 1960s and 1970s as "neo-corporatism" in response to the new economic threat of recession-inflation. Neo-corporatism favoured economic tripartism, which involved strong labour unions, employers' associations and governments that cooperated as "social partners" to negotiate and manage a national economy. Social corporatist systems instituted in Europe after World War II include the ordoliberal system of the social market economy in Germany, the social partnership in Ireland, the polder model in the Netherlands (although arguably the polder model already was present at the end of World War I, it was not until after World War II that a social service system gained foothold there), the concertation system in Italy, the Rhine model in Switzerland and the Benelux countries and the Nordic model in Scandinavia. Attempts in the United States to create neo-corporatist capital-labor arrangements were unsuccessfully advocated by Gary Hart and Michael Dukakis in the 1980s. As secretary of labor during the Clinton administration, Robert Reich promoted neo-corporatist reforms. [A]t the national level the state recognizes one and only one organization (say, a national labour union, a business association, a farmers' association) as the sole representative of the sectoral interests of the individuals, enterprises or institutions that comprise that organization's assigned constituency. The state determines which organizations will be recognized as legitimate and forms an unequal partnership of sorts with such organizations. The associations sometimes even get channelled into the policy-making processes and often help implement state policy on the government's behalf. By establishing itself as the arbiter of legitimacy and assigning responsibility for a particular constituency with one sole organization, the state limits the number of players with which it must negotiate its policies and co-opts their leadership into policing their own members. This arrangement is not limited to economic organizations such as business groups and social organizations. The use of corporatism as a framework to understand the central state's behaviour in China has been criticized by authors such as Bruce Gilley and William Hurst. Other scholars such as Jennifer Hsu and Reza Hasmath have argued the framework is still useful for analyzing China's local state behaviour and its engagement with social actors. Studying how the government engages with NGOs in particular has been a key part of the analysis of how local authorities in China have adapted and employed corporatist measures. Hsu and Hasmath argue that corporatist measures "continue to be employed by local authorities as an effective means of ensuring the potency and relevance of the local state in a rapidly changing sector," while the state itself continues to retreat from the provision of welfare and social services. Local governments have adapted corporatist measures by "utilizing subtle or tacit forms of approval" to influence NGOs' operation. On October 9, 2007, an article signed by Viktor Cherkesov, head of the Russian Drug Enforcement Administration, was published in Kommersant, where he used the term "corporativist state" in a positive way to describe the evolution of Russia. He claimed that the administration officials detained on criminal charges earlier that month are the exception rather than the rule and that the only development scenario for Russia that is both realistic enough and relatively favorable is to continue evolution into a corporativist state ruled by security service officials. The process of this state evolving into a new corporativist [sic] model reached its completion in 2005. [...] The strengthening of the corporativist state model and setting up favorable conditions for quasi-state monopolies by the state itself hurt the economy. ... Cabinet members or key Presidential Staff executives chairing corporation boards or serving on those boards are the order of the day in Russia. In what Western country—except in the corporativist state that lasted for 20 years in Italy—is such a phenomenon possible? Which, actually, proves that the term 'corporativist' properly applies to Russia today. Illarionov described the present situation in Russia as a new socio-political order, "distinct from any seen in our country before". In this model, members of the Corporation of Intelligence Service Collaborators (KSSS) took over the entire body of state power, follow an omerta-like behavior code and "are given instruments conferring power over others – membership "perks", such as the right to carry and use weapons". According to Illarionov, the "Corporation has seized key government agencies – the Tax Service, Ministry of Defense, Ministry of Foreign Affairs, Parliament, and the government-controlled mass media – which are now used to advance the interests of KSSS members. Through these agencies, every significant resource of the country – security/intelligence, political, economic, informational and financial – is being monopolized in the hands of Corporation members". Analyst Andrei Piontkovsky also considers the present situation as "the highest and culminating stage of bandit capitalism in Russia". He believes that "Russia is not corrupt. Corruption is what happens in all countries when businessmen offer officials large bribes for favors. Today’s Russia is unique. The businessmen, the politicians, and the bureaucrats are the same people". ^ . Wiarda, Howard J (1996). Corporatism and Comparative Politics: The Other Great Ism. 0765633671: M.E. Sharpe. pp. 22–23. ISBN 978-0765633675. ^ Wiarda, Howard J., pp. 27. ^ Wiarda, Howard J., pp. 31-38, 44, 111, 124, 140. ^ Social Democratic Corporatism and Economic Growth, by Hicks, Alexander. 1988. The Journal of Politics, vol. 50, no. 3, pp. 677-704. 1988. ^ Bao-Er. China's Neo-traditional Rights of the Child. Blaxland, Australia: Lulu.com, 2006. Pp. 19. ^ a b Wiarda, Howard J., pp. 10. ^ a b Wiarda, Howard J., pp. 31. ^ a b c d e Wiarda, Howard J., pp. 35. ^ Murchison, Carl Allanmore; Allee, Warder Clyde. A handbook of social psychology, Volume 1. 1967. Pp. 150. ^ Conwy Lloyd Morgan, Conwy Lloyd. Animal Behaviour. Bibliolife, LLC, 2009. Pp. 14. ^ Wiarda, Howard J., pp. 37. ^ Wiarda, Howard J., pp. 38. ^ Bethell, Leslie (1993). Argentina Since Independence. Cambridge University Press. p. 229. ^ Rein, Monica (2016). Politics and Education in Argentina, 1946-1962. Routledge. The Church's social concept presented an alternative to the Marxist and capitalist positions, both of which it saw as misguided. Justicialism sought to extend this line of thinking. ^ Aasmundsen, Hans Geir (2016). Pentecostals, Politics, and Religious Equality in Argentina. BRILL. p. 33. ^ Wiarda, Howard J., pp. 39. ^ Wiarda, Howard J., pp. 41. ^ a b Wiarda, Howard J., pp. 29. ^ a b Wiarda, Howard J., pp. 33. ^ a b c R. J. Barry Jones. Routledge Encyclopedia of International Political Economy: Entries A-F. Taylor & Frances, 2001. Pp. 243. ^ Peter F. Klarén, Thomas J. Bossert. Promise of development: theories of change in Latin America. Boulder, Colorado, USA: Westview Press, 1986. Pp. 221. ^ Ferdinand Tönnies, José Harris. Community and civil society. Cambridge University Press, 2001 (first edition in 1887 as Gemeinschaft und Gesellschaft). Pp. xxxii-xxxiii. ^ a b c Antony Black, pp. 226. ^ Antony Black, pp. 223. ^ Antony Black, pp. 226, 228. ^ a b Waring, Stephen P. Taylorism Transformed: Scientific Management Theory Since 1945. University of North Carolina Press, 1994. Pp. 193. ^ Wiarda, Howard J., pp. 134. ^ "Fascism." Encyclopædia Britannica. Encyclopædia Britannica Online. Encyclopædia Britannica, 2010. Web. 15 April 2010 . ^ Parlato, Giuseppe (2000). La sinistra fascista (in Italian). Bologna: Il Mulino. p. 88. ^ Payne, Stanley G. 1996. A History of Fascism, 1914–1945. Routledge. Pp. 64  ISBN 1-85728-595-6. ^ The Routledge Companion to Fascism and the Far Right (2002) by Peter Jonathan Davies and Derek Lynch, Routledge (UK), ISBN 0-415-21494-7 p.143. ^ a b Morgan, Philip. Fascism in Europe, 1919–1945. Routledge, 2003. P. 170. ^ Lewis, Paul H. Authoritarian regimes in Latin America: dictators, despots, and tyrants. Lanham, Maryland, USA: Rowman & Littlefield Publishers, Inc, 2006. Pp. 131. "Fascism differed from Catholic corporatism by assigning the state the role of final arbiter, in the event that employer and labor syndicates failed to agree." ^ a b Robert Eccleshall, Vincent Geoghegan, Richard Jay, Michael Kenny, Iain Mackenzie, Rick Wilford. Political Ideologies: An Introduction. 2nd ed. Routledge, 1994. P. 208. ^ Waring, Stephen P. Taylorism Transformed: Scientific Management Theory Since 1945. University of North Carolina Press, 1994. Pp. 194. ^ "China，Corporatism，and the East Asian Model". By Jonathan Unger and Anita Chan, 1994. ^ Bruce Gilley (2011) "Paradigms of Chinese Politics: Kicking Society Back Out", Journal of Contemporary China 20(70). ^ William Hurst (2007) "The City as the Focus: The Analysis of Contemporary Chinese Urban Politics’, China Information 20(30). ^ Jennifer Hsu and Reza Hasmath (2014) “The Local Corporatist State and NGO Relations in China”, Journal of Contemporary China 23(87). ^ Jennifer Hsu and Reza Hasmath (2013) The Chinese Corporatist State: Adaptation, Survival and Resistance. New York: Routledge. ^ Reza Hasmath and Jennifer Hsu (2009) China in an Era of Transition: Understanding Contemporary State and Society Actors. Basingstoke: Palgrave Macmillan. ^ Hsu, Jennifer YJ; Hasmath, Reza (2014). "The Local Corporatist State and NGO Relations in China". Journal of Contemporary China. 23 (87): 516–517. doi:10.1080/10670564.2013.843929. ^ Hsu, Jennifer YJ; Hasmath, Reza (2014). "The Local Corporatist State and NGO Relations in China". Journal of Contemporary China. 23 (87): 517. ^ "Q&A: Putin's Critical Adviser". By Yuri Zarakhovich. December 31, 2005. Time magazine. ^ a b The Chekist Takeover of the Russian State, Anderson, Julie (2006), International Journal of Intelligence and Counter-Intelligence, 19:2, 237 - 288. Black, Antony (1984). Guilds and civil society in European political thought from the twelfth century to present. Cambridge, United Kingdom: Cambridge University Press, ISBN 978-0-416-73360-0. Wiarda, Howard J. (1997) Corporatism and comparative politics. Armonk, NY: M.E. Sharpe, ISBN 978-1-56324-716-3. Acocella, N. and Di Bartolomeo, G. , ‘Is corporatism feasible?’, in: ‘Metroeconomica’, 58(2): 340-59. Jones, R. J. Barry. Routledge Encyclopedia of International Political Economy: Entries A-F. Taylor & Frances, 2001. ISBN 978-0-415-14532-9. Baker, David, The political economy of fascism: Myth or reality, or myth and reality?, '"New Political Economy'", Volume 11, Issue 2 June 2006, pages 227–250. Marra, Realino, Aspetti dell'esperienza corporativa nel periodo fascista, "Annali della Facoltà di Giurisprudenza di Genova", XXIV-1.2, 1991–92, pages 366–79. There is an essay on "The Doctrine of Fascism" credited to Benito Mussolini that appeared in the 1932 edition of the Enciclopedia Italiana, and excerpts can be read at Doctrine of Fascism. There are also links there to the complete text. The 1928 autobiography of Benito Mussolini. Online. My Autobiography. Book by Benito Mussolini; Charles Scribner's Sons, 1928. ISBN 978-0-486-44777-3. Katzenstein, Peter. Small States in World Markets: industrial policy in Europe. Ithaca, 1985. Cornell University Press. ISBN 978-0-8014-9326-3. Olson, Mancur. The Logic of Collective Action: Public Goods and the Theory of Groups. 1965, 1971. Harvard University Press. ISBN 978-0-674-53751-4. Schmitter, P. C. and Lehmbruch, G. (eds.). Trends toward Corporatist Intermediation. London, 1979. ISBN 978-0-8039-9837-7. Rodrigues, Lucia Lima. "Corporatism, liberalism and the accounting profession in Portugal since 1755." Journal of Accounting Historians, June 2003. Look up corporatism in Wiktionary, the free dictionary. Professor Thayer Watkins, The economic system of corporatism, San Jose State University, Department of Economics. Chip Berlet, "Mussolini on the Corporate State", 2005, Political Research Associates. "Economic Fascism" by Thomas J. DiLorenzo, The Freeman, Vol. 44, No. 6, June 1994, Foundation for Economic Education; Irvington-on-Hudson, New York.